The bilberry's ability to improve vision is known in folk medicine for a long time and its fame was confirmed by numerous studies. Bilberries improve eye acuity, reduce eye fatigue caused by continuous work under artificial lighting, accelerate renewal of retina, that is sensitive to light. INGREDIENTS Bilberry fruits, vitamins B1, B2, B6, C, P, zinc (oxide), silicium (oxide), sugar, microcristalline cellulose. 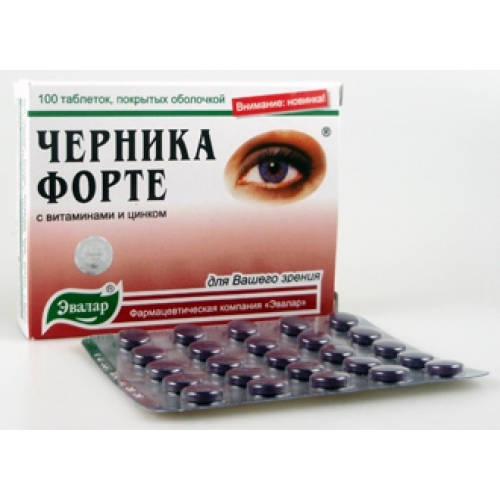 PROPERTIES Bilberry-Forte with Vitamins and Zinc is a balanced complex of vitamins, microelements and biologically active substances, necessary for daily support of vision and lowering risk of eye diseases. Biologically active substances of bilberry (anthocyanins, organic acids, carotenes, pectic substances, microelements), acting in complex with vitamins of group B, C, P and zinc: - prevent eye fatigue, irritation and weakening of vision; - improve vision adaptation to darkness; - strengthen vascular walls, including eye grounds; - have a positive effect for vitamins deficit and disorders connected with it; - improve health in general. RECOMMENDED INDICATIONS Recommended as agent having positive influence on the body in general and especially helpful in the preventive treatment of eye diseases, improving daylight and twilight vision, and as an additional sourse of vitamins B1, B2, B6, C, P and microelement zinc, which doses correspond to the daily body's requirement. DIRECTIONS FOR USE Adults and children above 12 years take 2 tablets twice daily with meals. The dietary supplement can be taken during long period of time (2-4 months). The 10 days interval is allowed. CONTRAINDICATIONS People with individual intolerance to the product components are contraindicated. SHELF LIFE 3 years. This product is manufactured in EVALAR production facilities under pharmaceutical conditions with multistage quality control meeting the requirements of GMP international standard.